The TV network's stock is cheaper than it's been in years. Here's why. Note: This article was originally published on Sept. 4, 2015, and was updated on Jan. 13, 2016, to reflect the latest business trends. What: TV network giant Discovery Communications (NASDAQ:DISCK) saw its stock fall 19% during the month of August 2015, according to S&P Capital IQ data. The drop has left shareholders staring at a 15% loss over the last full year. 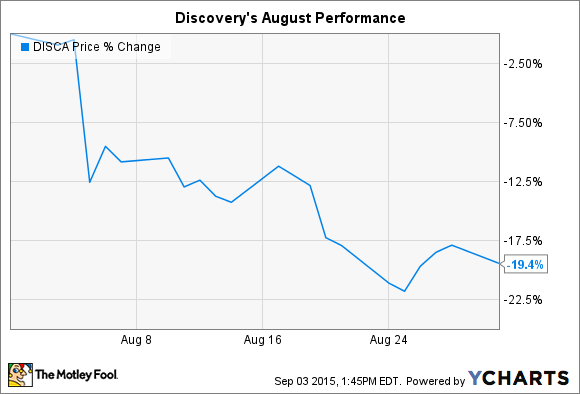 Discovery's stock ended 2015 down 22%, compared to a 1% loss for the broader market. So what: Sure, investors sold Discovery off as part of the general stock market carnage in August. But the bigger driver behind the drop was the second-quarter earnings results that Discovery announced early in the month. The company posted 3% higher quarterly sales along with 16% lower profits, just as Wall Street expected. Yet the results showed evidence of a slowdown in the TV advertising market that makes up more than half of Discovery's business. Higher ad prices failed to deliver any growth in the ad business, which was flat through the first two quarters of the year. Tempering that bad news is the fact that distribution fees are up 13% over the nine months ended on Sept. 30. The company's international business is also growing quickly. Still, it isn't encouraging that distribution and affiliate fees account for almost all of the network's global sales and profit gains through the first three quarters 2015. Now what: Management seems more optimistic about Discovery's growth potential than Wall Street. In fact, executives believe advertising sales with be "up solidly year-over-year," Chief Financial Officer Andy Warren said in a November conference call with analysts. That's why investors who prefer to buy stocks during times of pessimism might want to take a closer look at Discovery. The overall market has sold off, and media companies have been hit particularly hard lately. All of that negativity has pushed shares to a valuation of just 16 times the past year's earnings, which is the cheapest quote we've had for Discovery's business since early 2012.